It is 50 years since Sydney Dance Company (under a different name or two in its early years) gave its first performance. The time had come to commemorate the company’s remarkable longevity, and its absolute commitment to contemporary dance. Rafael Bonachela’s first season for this anniversary year celebrated with a triple bill consisting of a brand new work from Bonachela himself, and works from two female choreographers, Gabrielle Nankivell and Melanie Lane. The program opened with Nankivell’s Neon Aether, which to me was not the strongest work of the evening, although it was the loudest and the one that included the most confronting elements. It was difficult to fathom exactly what was going on onstage, what the work was ‘about’. The choreographer’s statement that it was ‘an ode to the burning intangibles that fuel our imagination’ didn’t help, and the most confronting bit was that often there was a sudden, long-ish blackout and a recorded announcement (part of the score by Luke Smiles) could be heard during the blackout. The announcement had something to do with a voyage in space. The blackout bit seemed to me to be a somewhat outmoded way of presenting an idea. This aspect of Neon Aether reminded me of William Forsythe’s Artifact, which goes way back to 1984, when dropping the house curtain at various stages throughout the work, and thus obscuring our view of the dancing, seemed an outrageous step forward that made us question many things. Not any more. I found the blackouts in Neon Aether an annoyance. While the dancing was spectacularly good, as we have come to expect from Sydney Dance Company, the work just left me a little cold. Bonachela’s Cinco followed. 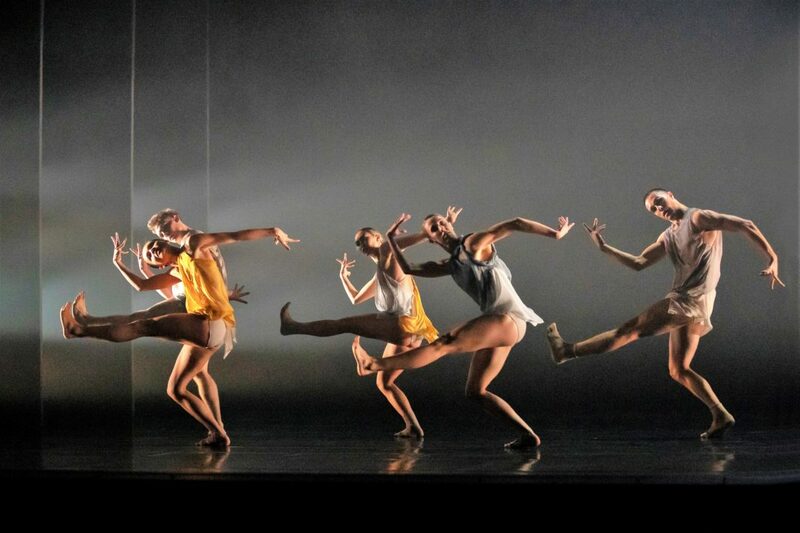 Made on just five dancers to five movements of a string quartet by Alberto Ginastera, the number five is of course a reference to five decades of dance from Sydney Dance Company. But, like most of Bonachela’s works, it was inspired not by any narrative idea but by the changing patterns and rhythms of the music. Its combination of solos and unison pieces was often filled with the unexpected, but was always a visual delight. And the silken costumes by Bianca Spender were also visually fascinating, flying around the dancers’ bodies with every move those dancers made. The absolute highlight of the evening for me was Lane’s somewhat eccentric work WOOF. It began with the twelve dancers who made up the cast grouping themselves and holding the pose for a short time, giving us the opportunity to take in the complexity of those group shapes. What was going on between them? Some of the groupings even seemed ferocious with a large group of dancers growling at a much smaller group. As movement took over from stationary groups, I admired Lane’s awareness of the space of the stage and how to fill it, or leave it empty, for maximum effect, not to mention her juxtaposition of movement and stillness. And her movement vocabulary with its tiny runs on half pointe with bent knees, or its group marching, or its eccentric details of head and arms, was fascinating to the point of being exciting. With its emphasis on groups and their interrelationships, along with the often relentless quality of the work, aided by a commissioned score from composer Clark (who does not use a first name on the program), it reminded me of a contemporary version of Rite of Spring. It was an outstanding work that generated an exceptional audience response. 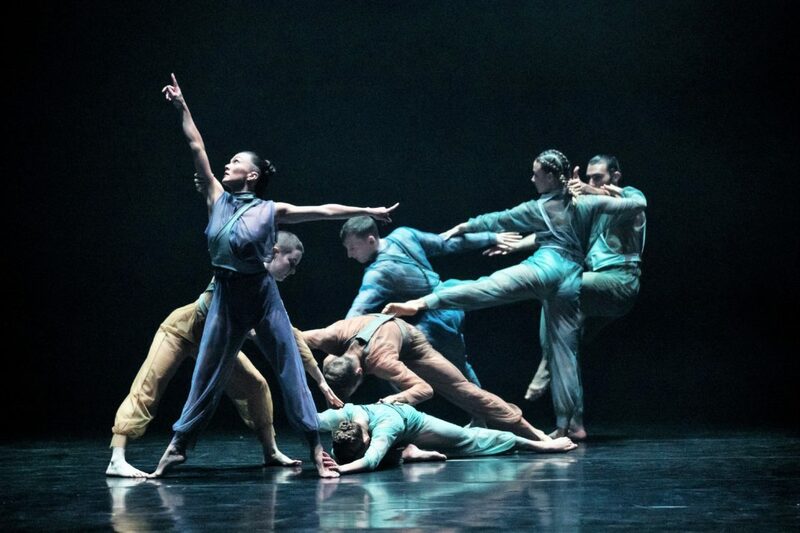 The diversity of material that the dancers were asked to perform in this triple bill was remarkable and, in their usual fashion, they rose to the occasion and looked stupendous throughout.